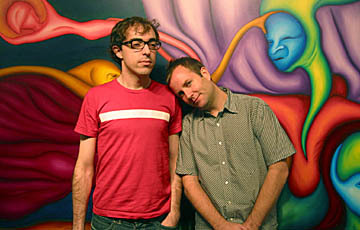 The poets pose in front of a painting by Scotty Johnson. In the U.S. Macgregor Card is best known for his editing of The Germ, A Journal of Poetic Research, which is one of the finest coterie publications of our age, and also publishes a series of monographs, among them Brandon Downing's The Shirt Weapon. However a cursory google search reveals that abroad, Macgregor Card is synonymous with the very best in consultancy and support services for advanced styling. Founded by the industry's most experienced and respected figures, Macgregor Card provides commercial, marketing and artistic development to his ever growing number of clients. Each individual client he takes on benefits from the wealth of experience, knowledge and business acumen offered by Macgregor Card, and receives direction in areas such as finance, marketing, creativity, staff management and legislation. Macgregor Card prides himself on providing the utmost in customer service at all times. His attention to detail offers his clients a unique experience while relaxing in one of his franchise's many comfortable seats, awaiting their initial encounter with Macgregor Card. If he has his way, it will surely not be their last. Please welcome Macgregor Card. When Brandon Downing was ten years old, he was playing with his best friend Annie when Annie was hit by an automobile. The emotion Brandon felt as he held his dying friend awakened his latent poetic powers, but left him in a withdrawn and deeply depressed state. Moreover, he discovered that he could not control his newly awakened abilities, and had to isolate himself from other people simply to keep hold of his sanity. Fortunately Brandon was soon taken under the wing of Professor Exegesis, who trained Brandon in the use of his special gifts and introduced him to the other misfits versifiers who together would come to be called the X-Poets. Though they encountered many adversaries, including Syllabic Man, Deconstructo, and the Villain-elles, things were basically hunky-dory for the dashing young X-Poets until Brandon was exposed to a lethal dose of iambic pentameter on a mission to save poetry from itself (one of the many paradoxes the group faced). Brandon became linked with a primal energy force known as the "shirt-weapon" on this mission, and though at first he was able to keep it under control and use its beautiful yet deadly cuffs, buttons, and epaulets for good, he eventually fell victim to the dark side of the energy force, unleashing the malevolent alter-ego known as Dark Brandon. As recounted in issues 117 through 135 of X-Poets, the Dark Brandon entity wreaked incredible devastation on poetry, nearly destroying the synedoche-metonymy continuum, however Brandon's true personality reasserted control of the shirt weapon at the last moment, and Brandon nobly committed closure rather than risk the reemergence of Dark Brandon. It was later revealed, of course, that Brandon's verse did not end, nor had he ever really become Dark Brandon, though that is a story for another time. For now it is enough that he continues to battle the evils of poetry through his words, pictures, and films. Please welcome Brandon Downing. This entry was posted in Uncategorized on August 29, 2006 by Kelly.